Beyond Horizons: :WW - Gotcha! 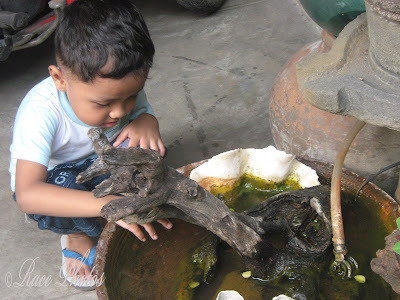 This was Josh as we caught him playing with the little pond in my friend's Gazebo. He almost touched the water when I called him and he instantly looked at me, smiled and asked 'Why Mommy?' Josh is like that he always thinks that he can get away with a smile lol! Anyway with our family members in the house he actually can :-) Even her sisters who sometimes pretends to be angry with him can't hide the laughs for long, they will break down when Josh shows his teeth :-) He's such a dear kid always making us laugh with his antics! See my other entry here!